After Konami’s very public split with Metal Gear creator Hideo Kojima, comes Metal Gear Survive – the company’s first entry in the franchise since Kojima’s departure. For better or worse, it shuns its stealth roots for survival and crafting elements, along with action aplenty. Metal Gear fans might cringe at the prospect of this take on the series, but much like Metal Gear: Ghost Babel, Konami claims that Survive is non-canon despite taking place between Metal Gear Solid V: Ground Zeroes and Metal Gear Solid V: The Phantom Pain. Metal Gear Survive puts you in the role of a soldier brought out of a coma and sent to an alternate dimension, in order to put an end to a zombie scourge (known as Wanderers) that threatens the Earth. You’ll discover what happened to Charon Corps – a battalion of soldiers that were sent before you – and rescue survivors to help you stem the tide. 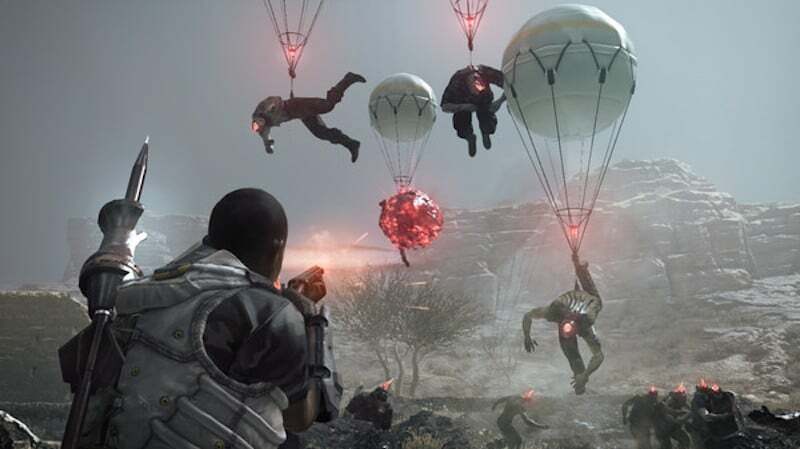 In a series fraught with conspiracy theories, nano-machines, and more than its fare share of the supernatural, Metal Gear Survive’s premise seems downright pedestrian. It doesn’t help that the opening couple of hours are far from entertaining. In fact they’re probably the most misleading in gaming history since Deus Ex’s Liberty Island mission, in the year 2000. Persist though, and you’re treated to a surprisingly solid experience. In terms of its narrative, Metal Gear Survive feels like a step up over 2015’s Metal Gear Solid V: The Phantom Pain simply because its major revelations aren’t limited to audio recordings. Without spoiling much, Metal Gear Survive’s story manages to be good enough to see you through the end once you’ve slogged past its first few hours. Speaking of Metal Gear Solid V: The Phantom Pain, Metal Gear Survive borrows from Kojima’s last Konami game in the sense that it is in third-person and has familiar traversal mechanics, making combat and movement equally responsive. This doesn’t mean you can throw caution in the wind though because unlike past games, you don’t don the role of a superhero like Big Boss. What this means is, you’ll also have to contend with concerns like thirst and hunger. The game introduces you to survival mechanics like hunting and cooking. Early on, there’s an immense amount of pressure to keep yourself well fed and far from dehydrated, creating a sense of tension that makes initial missions feel rogue-like, and you’ll constantly have to choose between just completing the main objective, or going above and beyond it by scouring for extra supplies at the risk of death. While you come to terms with being forced to scavenge for an ample amount of food and water, you’ll also be introduced to crafting weapons, ranging from rudimentary spears to guns with the silenced pistol and bow being good enough for most of what the game throws at you — hordes of zombies. As you progress you’ll come across an assortment of foes ranging from a standard shambling monstrosity that closes in to attack you, to grander Godzilla-esque, Lovecraftian horrors that fill up your entire screen. Before you know it, you find yourself in this loop of going out on a mission, crafting gear, managing survivors, cooking food, and purifying water. The missions themselves have the freeform nature of Metal Gear Solid V: The Phantom Pain. That’s no surprise considering the entire map of that game has been repurposed in Metal Gear Survive. Along the way, you’ll also have a base to run. Like in Metal Gear Solid V: The Phantom Pain, you’ll rescue soldiers and bring them back to your base to help you run it more efficiently. Throw in the ability to make your own farms and collect rainwater, and Metal Gear Survive heaps layers of systems and mechanics over and above what we’ve come to know and love (or detest) about Metal Gear Solid V: The Phantom Pain. So if you were expecting a stealth action-adventure, Metal Gear Survive is far from it. Sure, you can quietly traipse around specific obstacles and foes, but for the most part, the focus is squarely on running and gunning those in your way, punctuated by well-timed backstabs that end most enemies with a single hit and collecting resources like Kuban energy along the way to keep your base running and craft new equipment. 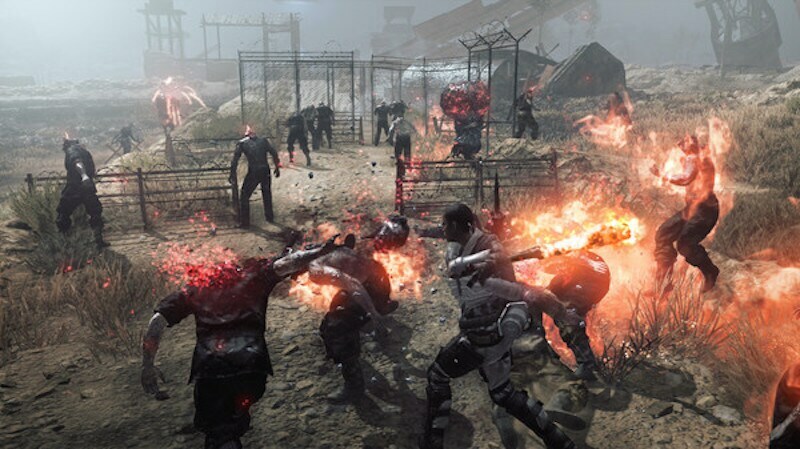 Most of Metal Gear Survive’s core mechanics translate well enough into its multiplayer cooperative mode where you and three other friends defend areas from a vast number creatures, similar to Gears of War’s Horde mode. The net code works as it should, though it will be interesting to see if this remains the case as more players check it out. 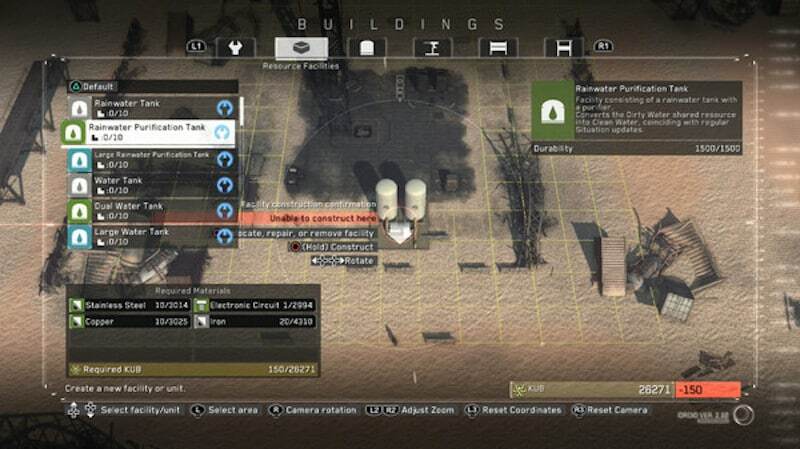 The resources gained from this mode can be used in the game’s campaign, which is a welcome move since Metal Gear Survive is, much unlike what’s been advertised, focused squarely on its single-player campaign. Which brings us to one of the game’s biggest disappointments — you can’t play it offline. Yes, due to the ability to use gear gained from one mode to another, you can’t play Metal Gear Survive offline. It’s an annoyance as this wasn’t the case with past games. A persistent Internet connection is mandatory. What makes it worse is that Konami thought it was a good idea to charge you for extra save slots. The game has four save files but you can only save on one of them. If you want to use the others you’ll have to pay $10 for the privilege. It’s an exceptionally mercenary move. Like most modern day big budget games, there are plenty of micro-transactions too. You can buy in-game currency known as SV Coins starting from $1 to $50 to purchase all manner of cosmetic items and resource boosters. Thankfully, there are no loot boxes at this juncture. Even with all these issues, Metal Gear Survive manages to stay fresh. This is in no small part thanks to the engaging story that gels well enough with its many survival and crafting mechanics. Together with its varied enemy types, and there’s more to like here than we imagined, and a lot of it good enough to sidestep the aforementioned issues. All in all, it’s this hodgepodge mix of ideas that makes Metal Gear Survive a unique entry in the franchise, and perhaps its most divisive entry yet. Dyed-in-wool Metal Gear fans will find plenty of reasons to hate it, and who can blame them given the controversy surrounding Konami and Kojima, but for the rest of us, it’s an intriguing experiment worth considering. Gadgets 360 played a review copy of Metal Gear Survive on the PS4 Pro. The game is available on the PS4 and Xbox One at Rs. 2,499 and on PC via Steam at Rs. 2,790 ($50 in the US). If you’re a fan of video games, check out Transition- Gadgets 360’s gaming podcast. You can listen to it via Apple Podcasts or RSS or just listen to this episode by hitting the play button below. These are the Yule Log videos to put on your Chromecast this Christmas!